It’s hard to miss the 6-foot-9 man weighing about 250 pounds walking through the lobby of the famed Peabody Hotel in Memphis, Tennessee. 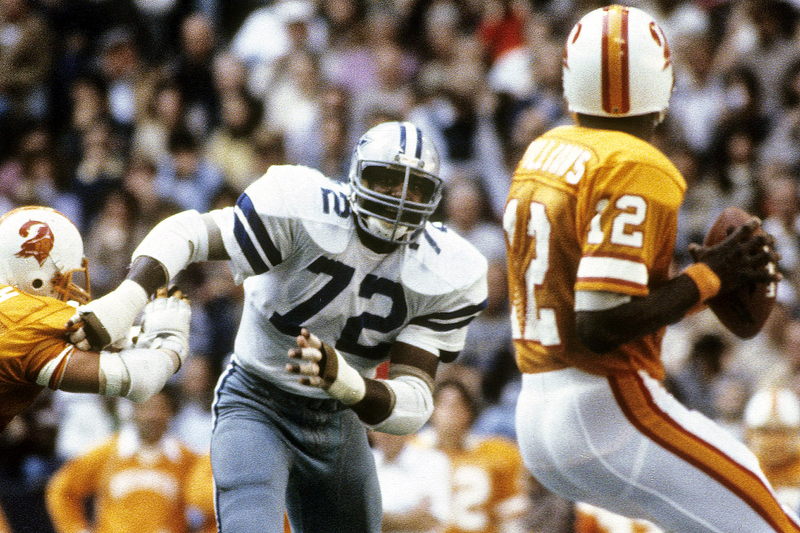 Ed “Too Tall” Jones, a member of the Dallas Cowboys’ famed “Doomsday Defense,” gets noticed. He was in Memphis last weekend to put on his annual golf classic in collaboration with the Southern Heritage Classic weekend, which features a big football game between Jackson State University and Tennessee State University. “This is the 27th for the Classic and the 25th year for the Ed Too Tall Jones Golf Classic. I absolutely love it because it’s Tennessee, and I have a home 83 miles from here in Jackson, Tennessee, that I still maintain,” Jones told The Undefeated. The game and the classic give Jones the opportunity to see people he only sees once a year from his hometown and his alma mater, Tennessee State. Jones participates in the entire weekend, and his favorite parts of the three-day event are the concerts. In 1974, the Dallas Cowboys had the No. 1 overall draft pick for the first time in their history. They selected Jones out of TSU, which he said was one of the proudest moments of his life. “Going to a Division II school, being the first lineman ever drafted No. 1 overall, is mind-boggling to me,” Jones said. “Here I am a country boy from Jackson, Tennessee. The first overall pick made me so proud. Jones is a proud grad of a historically black college (HBCU) and doesn’t mind giving back. Jones played baseball, basketball and ran track through his childhood years and in high school. It wasn’t until his brother-in-law recognized that he could use his size and agility on the football field that he considered that sport seriously. Jones’ brother-in-law became his mentor. He had earned scholarship offers to schools all over the country for baseball and basketball and had settled on Arizona State. After his father died, his mentor told him he should go to Tennessee State, which is two hours away from his hometown, to be closer to his mother. He was a mere 6-foot-7 back then. The staff at Tennessee State told him he would be the tallest person in the game of football at the time and they really wanted him to play basketball and baseball. But he was determined to play football. Staff warned him about the risks of the game. He was told that most injuries are knee injuries and they often occur in the fourth quarter when fatigue sets in. He was told that if he was lucky enough to make the program at Tennessee State, he’d have to be the most conditioned athlete to protect his knees due to his height. Jones was committed to a rigorous workout program. He said he was always the first player to work out and the last one to leave. He not only worked out with the football team, but with the baseball team as well. The defensive lineman became a two-time All-American and the team lost only two games under head coach John Merritt. They won championships in 1971 and 1973. Jones ranks third in school history in sacks in a season (12) and fifth in career sacks (38). “And it paid off. I never missed a game. I never missed a game in college. Never missed a game in the pros – 15 years. The only practice I missed was when I went home for my mom’s funeral. I’m not the only person that had a good work ethic. So that’s why a day doesn’t go by that I don’t count my blessings,” Jones said. Defensive end, Ed Jones #72 of the Dallas Cowboys gets past guard Charley Hannah #73 of the Tampa Bay Buccaneers to rush quarterback Doug Williams #12 during an NFL football game circa early 1980’s at Texas Stadium in Dallas, Texas. Being drafted to the Cowboys was a dream come true for Jones. He was the first player from an HBCU to go that high in an NFL draft. He’d been a Cowboys fan growing up and remains one to this day. “We didn’t have a professional team in Tennessee during that time and I grew up on a farm. We only got to see the Cowboys or the St. Louis Cardinals, Arizona Cardinals now. Well, Dallas was winning, so we got to see the Cowboys a majority of the time,” Jones added. Transitioning from college into the pros was fairly easy for Jones. Jones has taken notice of the recent protests at pro football games during the national anthem by San Francisco 49er Colin Kaepernick and other NFL players and he believes that they have every right to do so if it’s coming from the heart. Jones looked up to several athletes, including football great Deacon Jones, basketball star Oscar Robinson and famed boxer Muhammad Ali, whom he got a chance to meet. He has a signed glove on display in his home. The glove is unique because it was not signed with a permanent marker and the signature is distorted from the bleeding of the marker. If Jones could’ve given his younger self some advice, he’d tell the adolescent to work hard. As at a tennis player and fan, he was glued to this year’s US Open and watched Serena Williams as she lost in the semifinals. Jones got involved in business during his years with the Cowboys. He invested in a lot of different ventures before retiring from football in 1990. “I didn’t think I’d be around. Little did I know, I’d play 15 years. So I was already established in business when I walked away from the game, so that transition was very easy for me. I haven’t missed it. Even though Dallas is struggling, I’m still a big fan. We haven’t done anything in 18 years. I’m still at peace with myself because I’m not sitting watching the game thinking there is something I can do to help,” he said. “I went from fast-food chains, real estate, tax service, promoting concerts, just getting involved in as many things as I could. Until this day we have bought and sold things.” He’s launching a social media company in January 2017. “I will never retire and I try and keep as many irons in the fire as I possibly can and I absolutely love it. I played with very smart coaches who wanted to fool your opponents, so we had to study a lot. That was one of the things our coaches taught us. If you want a career here, you’ve got to work hard, study hard, you got a career here. When you’re involved in a lot of different things, it’s the same thing. I took the same attitude that I had on the football field into business.